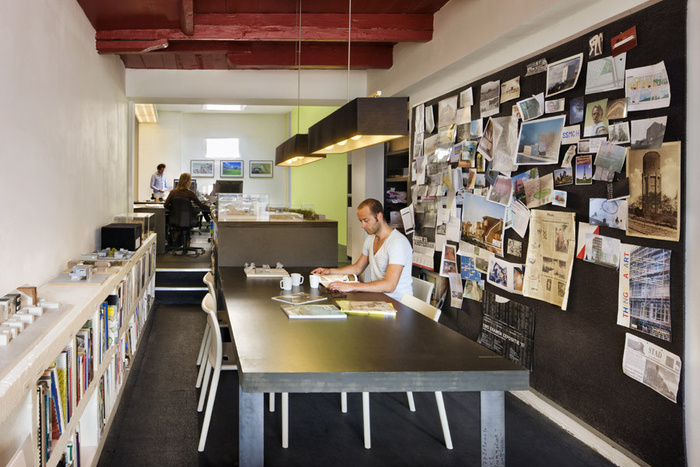 Located in the old city center of Utrect, the offices Netherlands-based Zecc Architects were created to be a low cost, yet functional office space for 8 employees. The design called for basic materials – such as a book case made of styrofoam and workspaces made of MDF. Because of the inexpensive nature of the materials, it might seem like the office would have a cheap look, but the space ties together very well. The workspace room, with its 4 desk islands, gives employees ample work area – and easy access to the materials/samples library. Located in an adjacent room is the collaborative brainstorming zone with a wall built for real-world pinboards, tables big enough to spread out plans are built at two levels, and additional inspirational resources. The office was designed by Zecc Architects themselves and is surely a great environment to work with clients.